Dimensions: 9 1/4" x 12 1/4"
Fountain Pens and Pencils is for all people using, owning, or collecting fountain pens and their matching pencils. It will introduce the beginning pen collector to the hobby and answer questions asked by the advanced collector about the earliest and rarest pens. Over 1,000 fountain pens, from such makers as L.E. Waterman, Montblanc, and Moore, are shown in full- or nearly full-sized photographs. 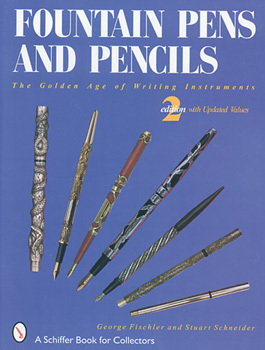 A collection of advertising, historical overviews and an updated value guide make this a must for collectors, dealers and any pen lover.